by Magali Delgado & Frederic Pignon - softcover, 184 pages; Profusely illustrated with color photos. If you've seen the DVD, (or the live show) and wondered how in the world they get those horses to perform so brilliantly, show after show, then this is the book for you. When Cavalia-the amazing equestrian-themed "spectacular," melding costumes and theatrics with stunt riding and haute ecole-first took North America by storm in 2003, few people knew who Frederic Pignon and Magali Delgado were. But the whole world was soon abuzz with talk of the magical display these two remarkable individuals provided their audienceÑwhether horse-crazy or layperson, none could walk away unaffected by the powerful connection they demonstrated with their unparalleled cast of beautiful horses. 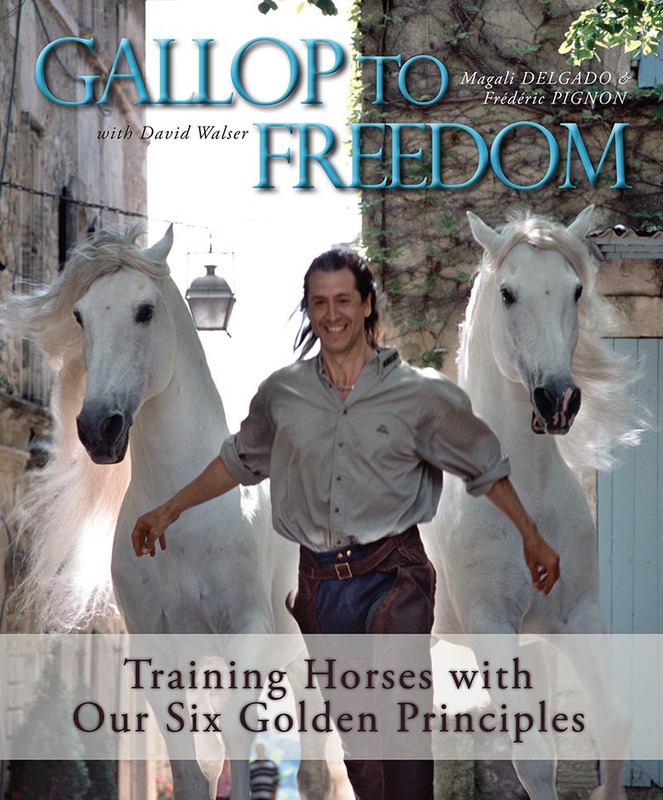 Now in this remarkable book, Frederic-a specialist in liberty and ground work-and Magali-a talented dressage rider at the Grand Prix level-combine efforts and share the secrets of the breathtaking relationships they have cultivated over the course of their lives with horses. They tell the story of Templado-the gorgeous but rebellious stallion who demanded they question all they had learned as horsemen and look at, in a whole new light, what it means to train horses. It was this tempestuous character that taught them that the process of building a relationship with a horse can be on more equal footing than most would dream possible. It is with this life-altering lesson in mind that Frederic and Magali now explain their Six Golden Principles. These include how you can become a "safe haven"-the most important being in your horse's life-while ensuring he gets the leadership he craves and deserves. And, how to establish acceptable limits of behavior, as well as respect, without ever succumbing to anger or using force. They describe how to read horse behavior so you can better understand and communicate with your equine partner as an "individual." Plus, you'll see what it means to be patient and "give your horse a say" in his own trainingÑand just how rewarding the results can be. In a chapter devoted to their practical approach, you'll explore what is perhaps most central to their methods: the idea of "play" and how games can be used to develop a horse's intelligence, confidence, and desire to perform, whether at liberty or in the most difficult of competitive environments. Magali shares the example of her Grand Prix mount Dao, with whom she has reached the pinnacle of European competition, and whom dressage judges praise for his supple and stress-free performances. Both Frederic and Magali once thought they had become skilled and compassionate riders and trainers, but found that the monumental challenges presented by Templado turned their beliefs upside down and made them start again from the beginning. They now view their work with horses as a journey of endless discovery and infinite rewards. With this book, full of phenomenal color photographs of their horses, many of whom appeared in the show that first made them famous, you can join-and learn from-them.